Women with small or uneven breasts turn to us to give them a fuller, more proportionate look. When exercise isn’t enough, we offer surgical and nonsurgical solutions for improving your figure faster. We promise to provide exceptional care as we enhance the natural beauty of your face. We offer nonsurgical solutions for decreasing the effects of aging, weight loss or genetics. Men seeking to improve their appearance or boost their confidence rely on us for facial and body procedures. People choose the option of cosmetic surgery for a variety of reasons. There are times when health related issues make it a necessary procedure. There are other instances when it is purely for aesthetic purposes. Whatever the reason, cosmetic or plastic surgery can make wrinkles disappear, tighten tummies and increase or reduce the size of breasts. Taking advantage of modern medicine has helped so many people battle the aging process and live with a more youthful look. As a result, confidence heightens, self-esteem rises and people enjoy life a little bit more. For your chance to make the best version of you, contact Dr. Liszka and let his expertise go to work on you. Some of our most requested surgical procedures include breast augmentation, breast lift, liposuction, tummy tucks, body contouring, face and neck lifts, eyelid surgery, and rhinoplasty. 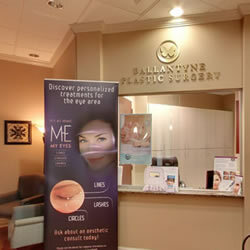 Ballantyne Plastic Surgery also offers dermal fillers, expert skin care, laser hair removal, laser treatment for stretch marks, as well as a variety of lasers to help your skin look and feel younger. There are many nonsurgical procedures and products that can help both men and women retain a younger, healthier look. Many different injections can fight off wrinkles, frown lines and restore faces with a much fuller look. Some of these nonsurgical products have an immediate effect and only require a quick and simple injection. You don’t have to resort to plastic surgery in order to take a stand against the aging process. There is an alternative in the many amazing nonsurgical products such as Botox, Dysport, Juvederm, Clear and Brilliance, and more. Any facial issues that have been brought on by age can now be dealt with without having to go under the knife. Women are not the only ones undergoing cosmetic and plastic surgery in this day and age. Many men are also opting for facial and body contour surgeries which include chin implants, cheek lifts, rhinoplasty, otoplasty, and liposuction. There are also a significant amount of men who experience gynecomastia, in which they have enlargement of the male breasts. A surgical procedure can alleviate this problem which affects a larger than realized percent of the male population. Men can feel safe, secure and confident when choosing any type of cosmetic surgery in Charlotte NC with Dr. Liszka.